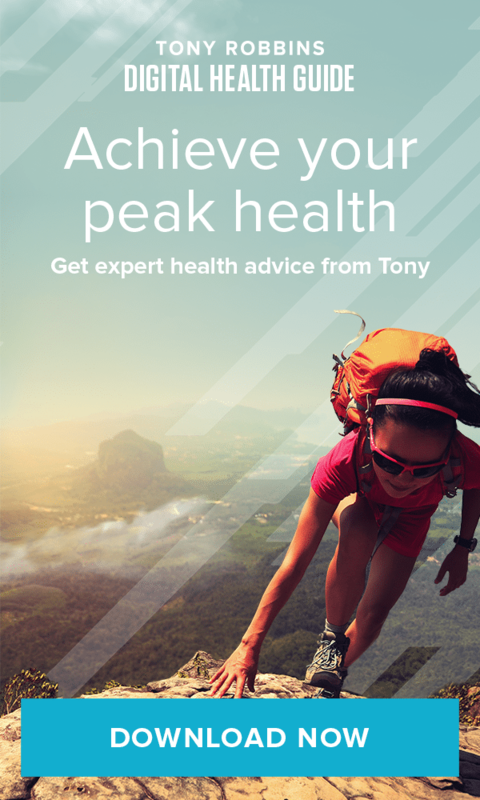 Home » The Tony Robbins Blog » Health & Vitality » Are plastic water bottles safe? It wasn’t that long ago that reusable bottles made of clear, polycarbonate plastic were all the rage — remember the Nalgene bottle every college kid in the country was toting around? Then the National Toxicology Program released a report about the potential health risks from a chemical in the polycarbonate known as bisphenol A, or BPA — an additive that makes the plastic more shatter-proof. BPA acts as a faux-estrogen and has been linked to a long list of maladies, including asthma, cancer, infertility, low sperm count, heart disease, liver problems and ADHD. And, in some cases, the effects appear to have been passed down, meaning the chemical reprograms an individual’s genes and causes disease in future generations. Consumer outrage ensued. In response, manufacturers, including Nalgene, which had become the poster child for this type of plastic, announced they would replace their polycarbonate bottles with a new version that was BPA-free. Problem solved? Not exactly. CamelBak-brand water bottles on display at an outdoor supply store in Arcadia, Calif., in 2008. 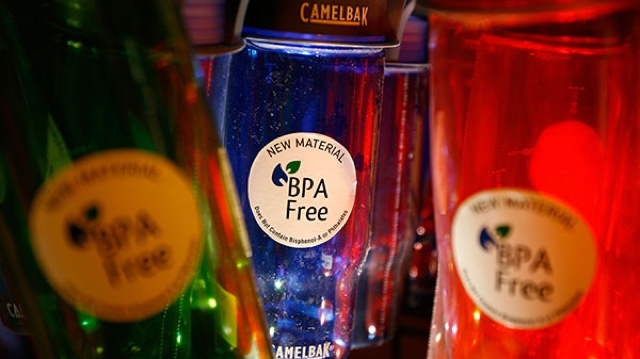 The company removed BPA from the plastic in its bottles. For all intents and purposes, the new co-polyester BPA-free plastic is an almost undistinguishable substitute. Marketed as a safe alternative to polycarbonate, it is just as hard, just as sleek and just as durable. But there is one very big caveat — it’s not clear just what the BPA was replaced with, and whether or not that chemical has been tested for estrogenic activity. As it is, there are more than 80,000 chemicals that are used in commerce in the United States, and only a very small fraction of these have ever been tested for safety. Under the U.S. regulatory system, chemicals are generally presumed safe until proven otherwise. This is how BPA slid under the radar for so long. But BPA is not the only chemical in plastics that could act like estrogen. Just how many other chemicals could be cause for consternation? According to George Bittner, professor of neuroscience at the University of Texas at Austin, there are at least a couple hundred other chemicals that are used to make some kinds of plastics that are almost certainly as much a problem as BPA. The only problem is that these tests were unable to determine the culprit. But just like BPA, the problematic chemicals used in these plastic products did lead to endocrine disruption, which is associated with higher rates of certain cancers, altered reproductive functions, early puberty, obesity, learning disabilities and behavioral changes. As the biological research on the health hazards of plastic products continues to pile up, the obvious question becomes: Why aren’t manufacturers providing more transparency when it comes to the chemicals being used? Well, the short answer (and the frustrating one) is that they simply don’t have to. In the United States, bottled water and tap water are regulated by two different agencies — the U.S. Food and Drug Administration (FDA) regulates bottled water and the U.S. Environmental Protection Agency (EPA) regulates tap water. And the disparity is astonishing. 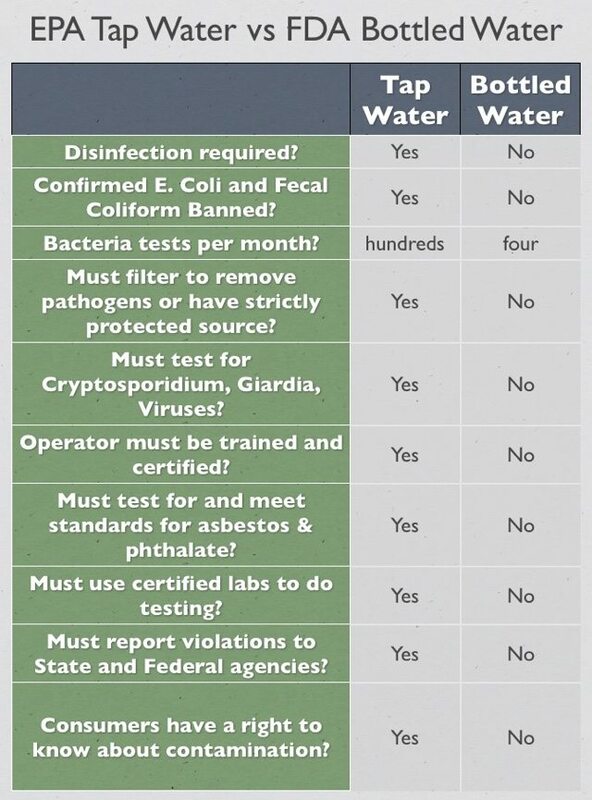 The Safe Drinking Water Act empowers the EPA to require water testing by certified laboratories and that violations be reported within a specific time frame. Public water systems must also provide reports to customers about their water, noting its source, evidence of contaminants and compliance with regulations. The FDA, by comparison, regulates bottled water as a packaged food item, and cannot require certified lab testing or violation reporting. The FDA also does not require bottled water companies to disclose where the water came from, how it has been treated or what contaminants it contains. The BPA issue did little to influence the FDA’s protocol and mandates. In fact, in February of 2014, a group of FDA scientists published a study finding that low-level exposure to BPA is safe. They touted this study as evidence that the long-standing concerns about the health hazards of BPA were unfounded. That is — the roughly 1,000 published studies which found that low-level exposure to BPA can lead to serious health problems were simply inaccurate. The plastics industry and the agencies that regulate BPA sided with the FDA’s position. While regulators and the plastics industry continue to challenge the science on the real-world harms of plastic water bottles, many scientists are saying the stakes are simply too high, and the alternatives too easy, to ignore. The bottom line is that most plastics are made from petroleum (oil or natural gas) and can contain a whole host of other chemicals that are never labeled and that can be toxic. And amidst the murky waters of marketing — where we are lead to believe that bottled water is cleaner and more pure, and BPA-free means you are in the clear — arming yourself with knowledge and becoming more cognizant about what you are ingesting is your best defense. The next time you fill your plastic water bottle up, or purchase a disposable bottle, check the container’s resin identification number — the number found inside the triangle of chasing arrows. While not all plastics labeled “7” — a category that is a general catch-all for plastics than do not fit into categories 1-6 — contain BPA, it’s still a good identifier, as are the letters “PC.” Also take caution that many of the bottles labeled as “BPA-free” also fall into this category. Plastic bottles with recycling code “3” should also heed caution, as they may contain phthalates. Known as the “everywhere chemical,” phthalates are a group of man-made chemicals that help make plastics more flexible and more difficult to break, and have been shown to leach into bottled water over time. Recent research has linked phthalates to an increased risk of high blood pressure and diabetes in children and adolescents, and a higher risk of miscarriage in women. And still other studies have associated phthalate exposure with reproductive and genital defects, lower testosterone levels in adolescent males, and lower sperm count in adult males. Plastic #1, or PET, short for polyethylene terephthalate, also warrants a cautious eye. Studies suggest that PET plastics used for water bottles leach antimony, a metalloid element that is a classified carcinogen. In small doses, antimony can cause dizziness and depression. And in larger doses, it can cause nausea, vomiting and death. And while the study does stress that the amounts of antimony were well below official recommended levels, it also discovered that the levels almost doubled when the bottles were stored for three months.